On Friday night, college football fans get to watch two top 25 teams go at it when No. 24 Boise State takes on No. 13 Michigan State at Spartan Stadium in East Lansing, Mich.
As soon as the two NCAA teams prepare for the opening kickoff at 8pm ET, you can start watching the game live online for free. To find live streaming coverage of Boise State at Michigan State online, just visit FreeCast and check out our Live Events page. From there, you will find direct links to help you watch Michigan State vs Boise State live online, absolutely free. Both teams head into the 2012 NCAA football season with new looks. Michigan St no longer has Kirk Cousin behind center while the Broncos also had to replace their former star quarterback, Kellen Moore. Cousins led the Spartans to back-to-back 11-win seasons in his final two years at Michigan State. Now, it’s Andrew Maxwell’s turn to lead the offense through the Big Ten. Watch Michigan St vs Boise St live online for free to see if Maxwell has gotten comfortable with the Spartan offense. Maxwell will have a tough road ahead of him as wide receivers B.J. Cunningham, Keshawn Martin and Keith Nichol are all gone too. Fortunately, the team still has their leading rusher, Le’Veon Bell, who ran for 13 touchdowns last season. 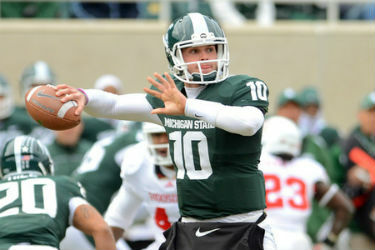 Watch Michigan St vs Boise St online live as Bell tries to help get the Spartans off to a 1-0 start. New Boise State quarterback Joe Southwick, who was the backup for Moore over the last two season, will face a big test in his first ever start in the NCAA. Michigan St usually has one of the better defenses in the country and players like William Gholston, Max Bullough and Denicos Allen should make things very difficult for Southwick. Southwick won’t be the only player on the Broncos with big shoes to fill. Running back D.J. Harper is faced with the task of replacing former star Boise St running back Doug Martin, who is now with the Tampa Bay Bucs. Watch Boise St at Michigan St live online for free as Southwick and Harper try to prove themselves against a strong Spartans defense. Chris Petersen has led Boise St. to opening game victories in all six seasons as head coach but considering the team lost its top running back, quarterback, linebackers and defensive linemen, there’s a good chance that run will come to an end when they take the field against the Spartans. Be sure to watch Boise St at Michigan St online live to see if the Broncos can pull an upset over the six-point favorite Spartans. Free live streaming coverage of Boise St at Michigan St will be available online beginning at 8pm ET when the two college football teams take the field for their season opener. You can also watch Michigan St vs Boise St live online for free through your tablet or mobile device as well as several other great college football matchups this season.